Information is a great tool in software development and it’s useful to have easy access to it. The more obvious you make your problems, the harder you make them to ignore. The more attention they get, the quicker they get solved. One thing developers like to monitor in software development is continuous integration status and metrics from running services. And what better way to achieve visibility and visualize to those metrics than building an information radiator. 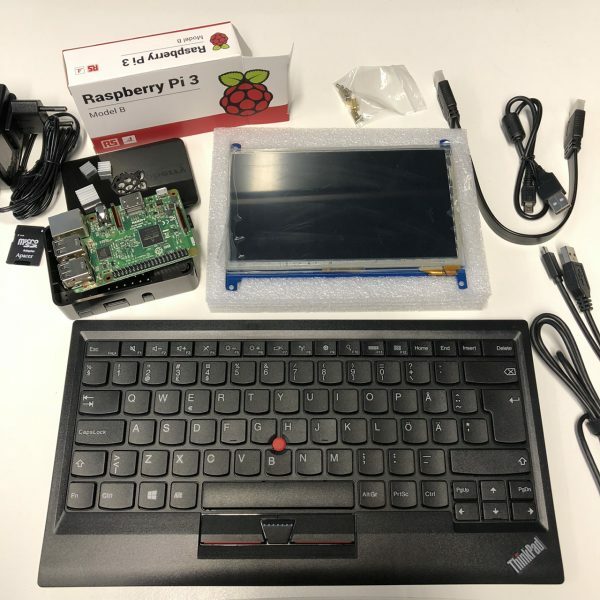 I didn’t want to invent the wheel again so I got Raspberry Pi 3 Model B with accessories and 7″ touch screen to base my project. 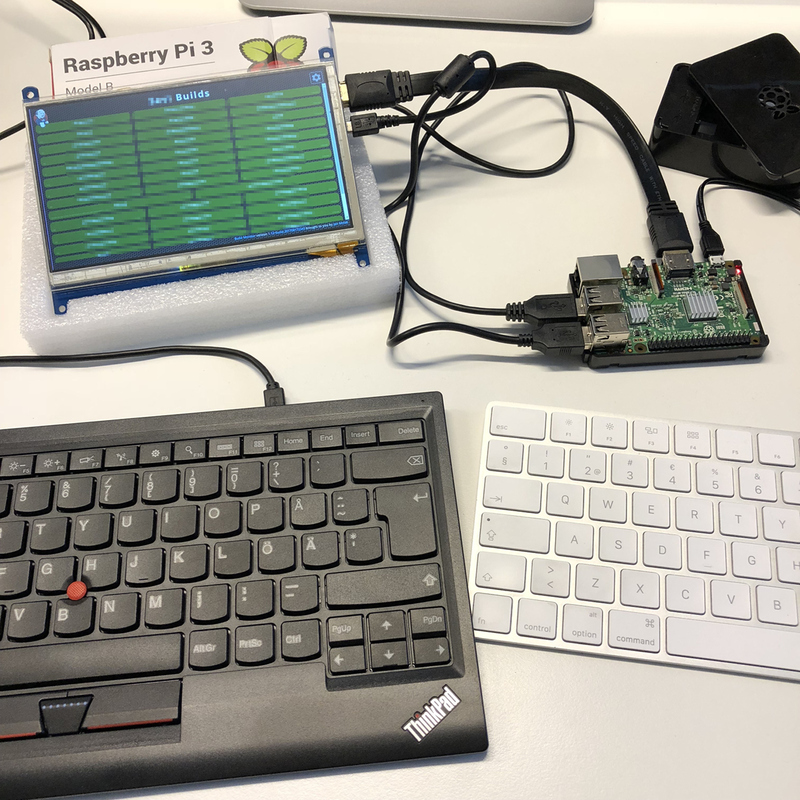 Using a Raspberry Pi as an information radiator isn’t a new idea and the Internet is full of examples of different adaptations with screens, lights, bells and whistles. For the start we just visualized our Jenkins builds and Grafana dashboard but later on we will propably do a custom dashboard. The information radiator is easy to get running as you only need a computer which preferably runs Linux. You can use an old laptop and attach it to external screen or if you’re like me and want to tinker you can get e.g. Raspberry Pi 3 and couple it with small external screen for portability. Nice and low cost solution which gets you some hacker value. I got the Rpi from our local hardware store and unfortunately the Model B+ was just released on the same day. The extra 15% power, 5 GHz Wifi and less heat and throttling would’ve been nice. I got the Raspberry Pi starting package with the official case, power supply, HDMI cable and a MicroSD card with preloaded NOOBS. So I just needed to connect the cables, put SD Card in and click to install Raspbian. Other interesting operating systems would’ve been Fedberry which is Fedora ‘Minimal, XFCE and LXQt’ Remixes. 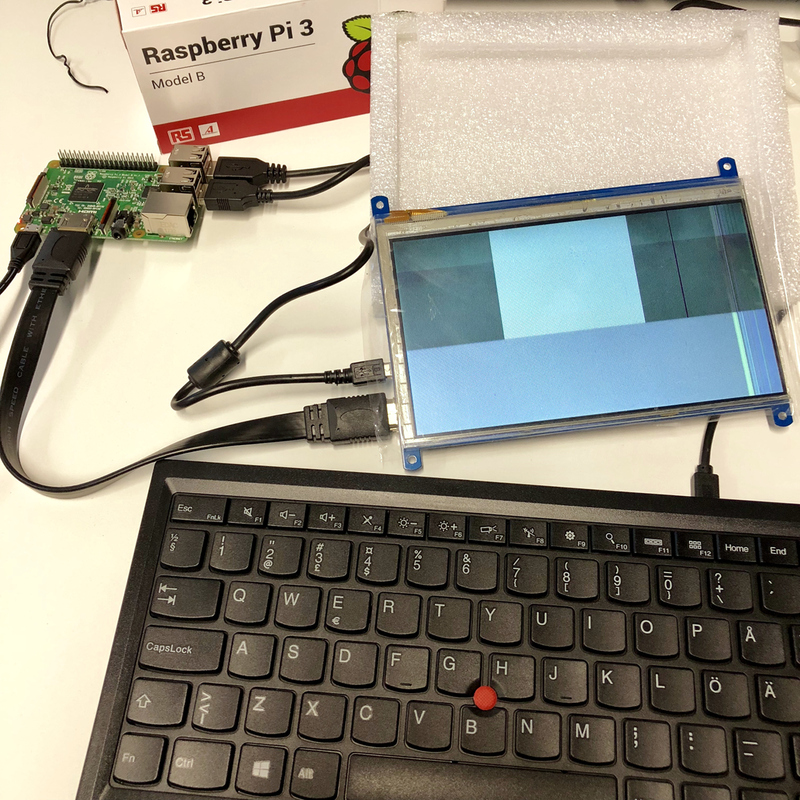 For the screen I used 7″ IPS 5 point touch screen for Raspberry Pi with 1024×600 resolution and HDMI from joy-it codename RB-LCD-7-2. Initially I thought I could install the whole system with this display but as it turned out Rpi doesn’t understand it out of the box. It just showed some white noise and interference . Luckily some one had already solved this and I got the right config after I had installed Raspbian with real monitor. And reboot your Raspberry Pi after those changes. You should also run $ sudo raspi-config to setup for example WiFi country to allow channels 12 and 13 and your current Timezone. I set up the Raspberry Pi at our local office and at home and there were no problems with WiFi connection. But when I brought it to customer premises the WiFi connection was weak and practically couldn’t move a bit. My MacBook worked fine but it was connected to 5 GHz network which isn’t an option with my Rpi 3 Model B. The WiFi on Rpi 3 was using channel 11 on 802.11i with WPA2 as shown with iwlist wlan0 scan. There is a thread on Raspberry Pi forum about Very poor wifi performance which suggest to set up WiFi internalisation correctly to allow channels 12 and 13. At one point the issue was that only channels 1-11 are available on the Rpi 3 but checking out the ‘next’ branch of firmware/kernel (sudo BRANCH=next rpi-update) apparently fixed channels 12/13. I was on kernel 4.9.80 so it wasn’t a problem for me. The other suggested problem is with Atheros chipset based router which doesn’t like Broadcom WiFi on Rpi 3. For some disabling power management solves the connection issues. For RPi built-in Broadcom (Cypress) WiFi there’s no control for power management and it’s disabled by the kernel. In iw / iwlist / iwconfig you see bug with “Power Management:on”. But nevertheless testing switching it off made my WiFi connection better but it’s strength didn’t of course change. The information radiator is usually connected to a TV with no keyboard or mouse attached so accessing it remotely is useful. You can use x11vnc which allows you to VNC into a headless Pi with a VNC client like Apple Remote Desktop, RealVNC’s vncviewer or homebrew’s tiger-vnc. To test our setup and quickly show some data I just added a Build Monitor view in Jenkins and other view with Dashboard view. I also configured the Rpi to automatically start Chromium browser in kiosk mode after reboots and directed it to Jenkins website so there would be no need for interactions to get things on the screen. To show several sources of data and get things running quickly without customized information radiator we used Revolver – Tabs Chromium extension to rotate between multiple browser tabs: one showed Jenkins Build Monitor other Grafana Dashboard and third Twitter feed. @chromium-browser --kiosk --no-default-browser-check --no-first-run --disable-infobars "http://localhost/"
$ cp /etc/xdg/lxsession/LXDE-pi/autostart /home/pi/.config/lxsession/LXDE-pi/autostart $ vim /home/pi/.config/lxsession/LXDE-pi/autostart #@xscreensaver -no-splash # comment this line out to disable screensaver # Disable Xsession from blanking @xset s off @xset -dpms @xset s noblank @sh ./autostart.sh # load chromium after boot and point to the localhost webserver in full screen mode @chromium-browser --kiosk --no-default-browser-check --no-first-run --disable-infobars "http://localhost/"
Chromium has a feature to show “Restore pages” nagging popup when not grafefully shutdown and you can try the following Stack Overflow suggestion. What was also suggested was doing “chmod 001 ~/.config/chromium/Default/Preferences” but it results to another nagging window. You could use “–restore-last-session” or “–incognito” parameter which also works but it has several disadvantages, such as disabling the cache and login information. Or maybe I should just use Firefox. It might be also useful to set Chromium to restart every night. When running Chromium for longer periods it may fill Rpi’s memory with garbage and after it must be hard rebooted. If you’ve problems with the above script try this which is the original but change “curr_vt=`fgconsole`” to be “curr_vt=`sudo fgconsole`” as fgconsole needs sudo privileges and otherwise you get an error “Couldn’t get a file descriptor referring to the console”. Showing just Jenkins Build Monitor or Grafana dashboards is simple but to get more information of things running you could show things like the success rate of the builds, build health, latest open pull request and project Twitter Messages. One nice example of information radiator is Panic’s Status board. There are different ways to create customizable dashboard and one way is to use Dashing which is a dashboard framework and to get headstart you can see Project Dashboard https://github.com/martin-naumann/project-cockpit is which shows “build health” for the latest build, the latest open pull request in Github, the success rate of your builds, some free-form text and your project’s or company’s logo. It uses the Jenkins API to get the ration of successful / non-successful builds as well as the latest build state. It also calls the Github API to get the latest pull request to display the name and picture of the author and the title of the pull request on the dashboard. For more leisure use you can set up the Raspberry Pi as a wall display to show information like calendar, weather, photos and RSS feeds. One option is to use Dakboard which is a web interface used to display information and is quite configurable with different services. At first Dakboard seems nice but is quite limited on what data it can show and some useful features are premium. Another open source option is MagicMirror² which seems to be more modular and extensible (as you can create your own modules) but needs more tinkering. This is a great article and very helpful. I’m trying to do this as a school project but would like to use Bluetooth LE. Can you provide some tips?